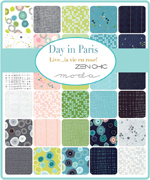 Day in Paris Zen Chic: Modern Metallic Blooming White Chalk -- Moda 1680-11M -- presale only! Day in Paris Zen Chic: Modern Metallic Blooming Dark Blue Navy -- Moda 1680-18M -- presale only! Day in Paris Zen Chic: Modern Metallic Watercolor Dots Pink Bubble Gum -- Moda 1681-13M -- presale only! Day in Paris Zen Chic: Modern Metallic Watercolor Dots Turquoise Teal -- Moda 1681-16M -- presale only! Day in Paris Zen Chic: Modern Metallic Blooming Teal -- Moda 1680-16M -- presale only! Day in Paris Zen Chic: Modern Metallic Blooming Pink Bubble Gum -- Moda 1680-13M -- presale only! Day in Paris Zen Chic: Modern Metallic Watercolor Dots Chalk -- Moda 1681-11M -- presale only! Day in Paris Zen Chic: Modern Metallic Twinkle Grey -- Moda 1683-12m -- presale only!